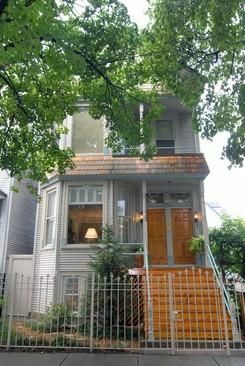 Great Lakeview location for easily rentable three unit building. The first floor duplex, originally the owners unit, has a spacious living room, dining room, top of the line kitchen with SubZero, Bosch & Viking appliances, plus granite countertops. Adjacent family rooms leads to a beautifully landscaped private yard with additional deck over the two car garage. Custom moldings, plantation shutters, hardwood floors. Perfect for live-in owner or tenants who will appreciate the finish level. Second and third floor rentals in excellent condition with central air conditioning. Tenants pay all utilities. Unbeatable location, terrific curb appeal.